THERE IS something intrinsically Gallic about the sound of the accordion, evoking visions (however hackneyed) of Parisiene walkways or vast Loire Valley vineyards to a bal-musette soundtrack of Émile Vacher – or alternatively, in current musical spheres, the highly regarded and prolific master of that instrument, Richard Galliano. The accordionist’s band was created with that multiformity in mind, though all originating from the same home town – Emile Parisien (saxes), Tony Paeleman (Rhodes, effects), Julien Herné (electric bass, effects) and Yoann Serra (drums). And having performed and rehearsed intensely, prior to this recording, it’s evident that they have crystallised their varying career experiences – eg rhythm & blues, hip-hop, pop, jazz, gypsy – into a tight yet exhilaratingly transitional new quintet. Indeed, after much listening, it’s the unpredictability and divergence of these nine numbers (mostly originals) which hold the attention. 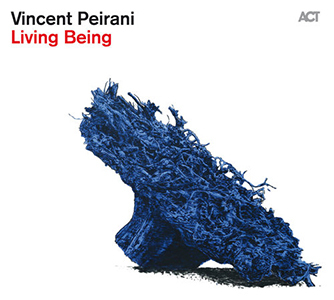 Vincent Peirani is clearly an accomplished accordionist, using his instrument to offer sustained walls of sound, rapid ostinati and fluid soloing – and the ability to closely meld his output with the often similar timbres of Tony Paeleman’s Fender Rhodes can be heard in Suite en V, Pt. 1, over which Emile Parisien improvises broadly on soprano sax. Dream Brother swings between accordion wistfulness and driving jazz/rock; and the hallucinatory groove of Mutinerie brings reminiscences of ’70s Soft Machine, complete with echoic effects and tricksy riffs. Air Song #2‘s powerful melodic intertwining of soprano, accordion and Rhodes ripples to an addictive electronic pulse from Paeleman, Herné and Serra. At almost nine minutes, Some Monk is both spacially and flamboyantly inventive, with a tangible impression of free group improvisation; and Julien Herné’s fabulously mobile electric bass is just one exciting element of fusion-feel Workin’ Rhythm, Yoann Serra’s precise drums combining with Peirani’s complex fingerwork and Paeleman’s joyously gruff Rhodes – priceless. Released on 9 February 2015, the successful weave of so many strands marks out Living Being as a compelling experience. Further information and audio clips are available at ACT Music.